Betty’s certification program offers a special enhanced process with on-line modules and group support, in addition to the mentoring and case study reviews. This is an excellent way to be supported and guided towards full EFT Certification. It is called the Emotional Freedom Mastery Program. Find out more by clicking on the picture to the right. Attend AAMET EFT Level 1 & 2 live workshops by an AAMET Trainer and receive your Certificate of Attendance. Pass the AAMET Level 2 multiple-choice exam. On-line at the AAMET website. You will need to join the AAMET with “Student” status before you sign up for the test. Please note: this step is usually done much later in the process, after the candidate has more practice and integration of the skills. Read and sign the AAMET code of ethics. Your trainer can provide you with a copy. It is also available on the AAMET website once you have joined as a Student. Discuss/sign your mentoring and practice program with the AAMET EFT Trainer of your choice. You are then a Level 2 Practitioner Candidate. It is especially important to establish a plan for regular mentoring and an approximate timetable for your certification. Most students take 9-12 months to attain Certification, though some highly motivated students have completed requirements within 6 months. 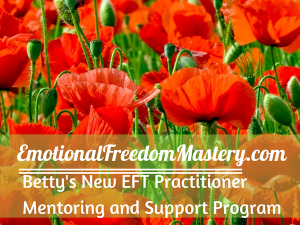 Betty’s EFM (Emotional Freedom Mastery) program gives you the structure, continuity, and support to attain certification with ease during that time frame. 50 hours of practice is the general requirement. It is preferable to work with a variety of issues, so a guideline is to work with 25 different individuals. However, you and your trainer can agree for you to log your hours with less clients, more sessions with each. You must keep a log of your time and a brief description of what was worked on. The AAMET considers this a discretionary requirement, meaning that it can be adjusted to suit individual needs. Discuss with your mentor. Please be aware that it is important to have on-going mentoring as you engage in practice sessions. It is not recommended for practitioner candidates to go off and do their practice sessions completely on their own. You are meant to touch base with your mentor frequently. The requirement is to complete a minimum of 6 mentoring hours. This can be through individual mentoring or through group mentoring in an on-going group of 8 or less. Betty’s EFM program is structured to meet and exceed these mentoring requirements. 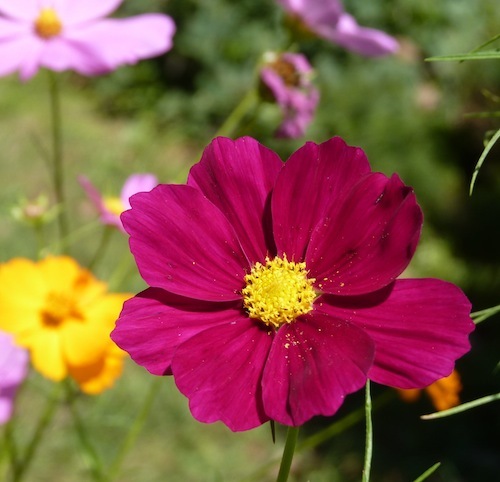 The Neurochemistry of Counterconditioning – Acupressure Desensitization in Psychotherapy – James R. Lane, PhD. Download the Lane Article here (or download below). Selections from Gary Craig’s Foundations and Borrowing Benefits DVDs. Currently Gary Craig has made the full videos free on his site. Betty’s minimum requirement is that you watch at least 5 sessions chosen from the Borrowing Benefits videos. Find them here: http://emofree.com/gcl-borrow/bb-started.html Be sure and open the left sidebar to find the full list of videos. These provide excellent further training and review. A few selections at your choice from Gary Craig’s free on-line tutorial. 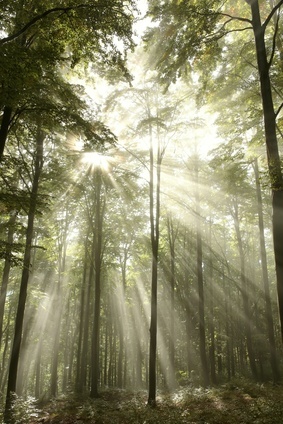 Read explanations of key concepts and watch some video excerpts at emofree.com/eft-tutorial/eft-tapping-tutorial.html. Look over the contents and choose what interests you. It’s especially helpful to you to simply know about Gary Craig’s on-line resource and refer to it as needed. You can also search YouTube for EFT videos relevant to a specific topic. Get in the habit of using the resources! Optional: please choose 2-3 additional resources to read or watch. These can be books, audios, and videos at your choice. Suggestions are below but you can find your own, too. The annual Tapping Summit packages with audios, transcripts and workbook so that you get EFT resources from a variety of presenters. AAMET Requires 4 Case Studies according to the AAMET guidelines plus possible additional demonstration of competencies per individual assessment by mentor. A recorded session can substitute for one of the case studies. 1) One of the studies is a personal report of how you’ve successfully used EFT for your own issue. 2) The other two are detailed reports. Each should show your work with a client preferably over the course of several sessions. We will provide a checklist of what to include and examples. 3) I am asking for a recorded session for your fourth case study. If you have questions about how to record and how to get the recording to me, let’s talk — it’s quite simple but may be different for each person depending on the technology you use. After you send me the recorded session, I go through it and take notes; then we plan for about an hour by phone to discuss the session. 4) Please notice the amount of detail in the example case studies (which will be provided). I would suggest that 9-12 double-spaced pages is a good guideline for each written case study. If your studies are not detailed and extensive enough, they will need to be re-done. Please note: The AAMET Case Studies Guidelines document has been recently revised. Please email me if you’d like to receive a copy of the Guidelines document, plus my own abbreviated Guidelines which also help you understand what is required for your Case Studies. When you and your mentor/trainer agree that you have completed all the requirements, your mentor contacts the AAMET to submit your name as an Accredited Certified EFT Practitioner, Level 2. You will then receive an email inviting you to join the AAMET with Practitioner Status. Your mentor sends you your AAMET certificate — CONGRATULATIONS!